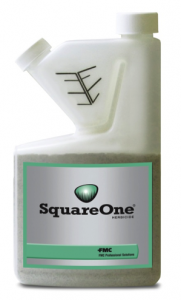 Designed for newly seeded turf, SquareOne herbicide offers control of crabgrass and broadleaf weeds—with a wide window of application. Unlike other products that are too harsh on new turf or require multiple applications, SquareOne can be applied just one day before seeding or as early as seven days after emergence on most cool and warm season grasses. Weed populations are reduced from the start, allowing for maximum turf density with fewer herbicide applications or the need to reseed. SquareOne works on broadleaf and grassy weeds present at application time. It continues to hold back grassy weed competition until new turf is established. SquareOne can be used in spring and fall on lawns, athletic fields, sod farms and golf courses.